So called ‘winter squash’ is one of my favourite fall and winter foods. (It is actually harvested in autumn.) The main characteristic that distinguishes it from ‘summer squash’ is the density of the flesh. Summer squashes are light and watery, storing briefly at room temperature or in refrigerated conditions. A summer squash past its best discolours and quickly goes squishy. Winter squashes are heavy and dense, and are suitable for long storage in cool pantries or cellars. When finally past their best, the skin will wrinkle and the fruit will begin to collapse in on itself, but will still be usable for a while. The taste of winter squash is similarly more robust than that of summer squash. There are many varieties available, but the one most easily found here in Wales at this time of year is butternut squash. Stuffing vegetables, especially squash, is incredibly easy and versatile, with the added benefit that you can shorten cooking time by kick-starting it in the microwave, and/or leave it in the oven to keep warm for a fairly long time. 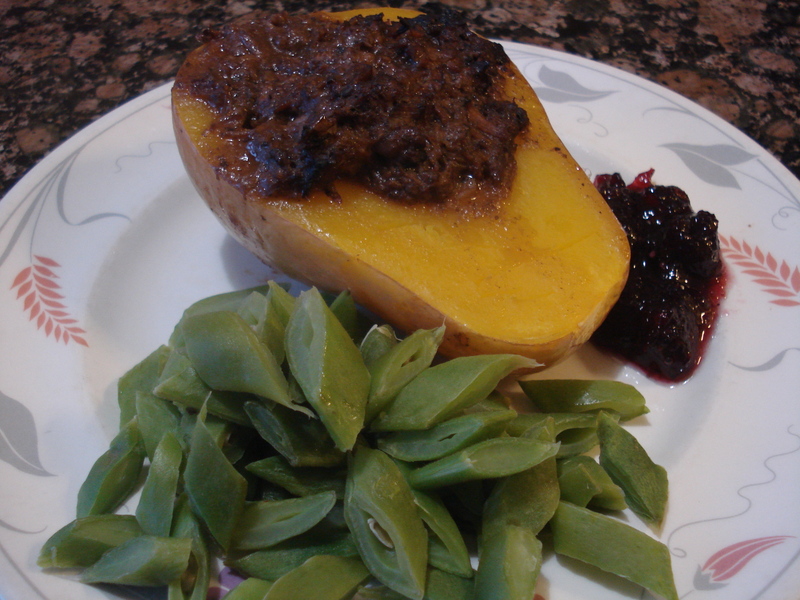 For this recipe, I used some of our own small, home-grown butternut squash, in prime condition. Cut squash in half lengthwise and scoop out the seeeds. Flash altered the colour of the flesh. Butternut squash should have a creamy orangey colour like this. Microwave on high power, cut side down, for 3-5 minutes. 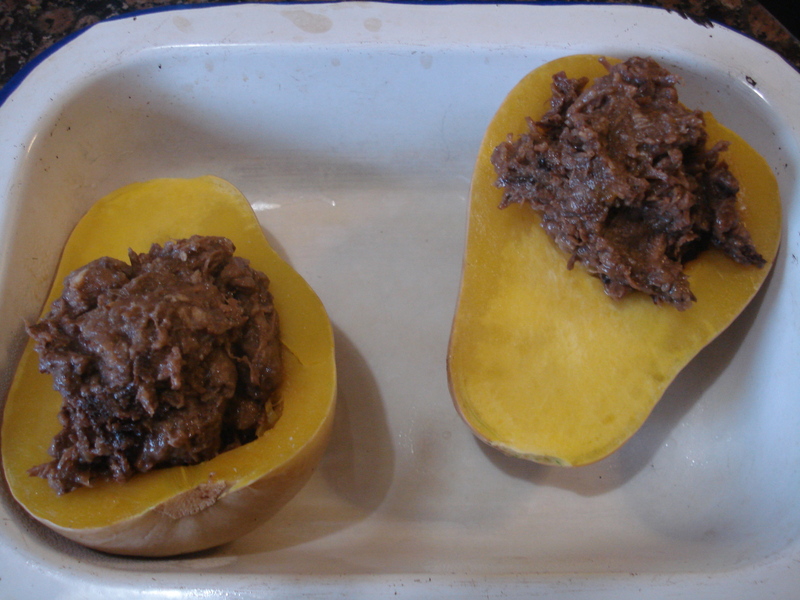 The squash should be hot to the touch, but the solid end should not be cooked through. Divide stew between the two squash halves. Place in baking dish and cover loosely. Squash stuffed and ready to cover before going in the oven. Notice that the hollowed/stuffed end has begun to take on a shine as it cooks, but the solid end has not. 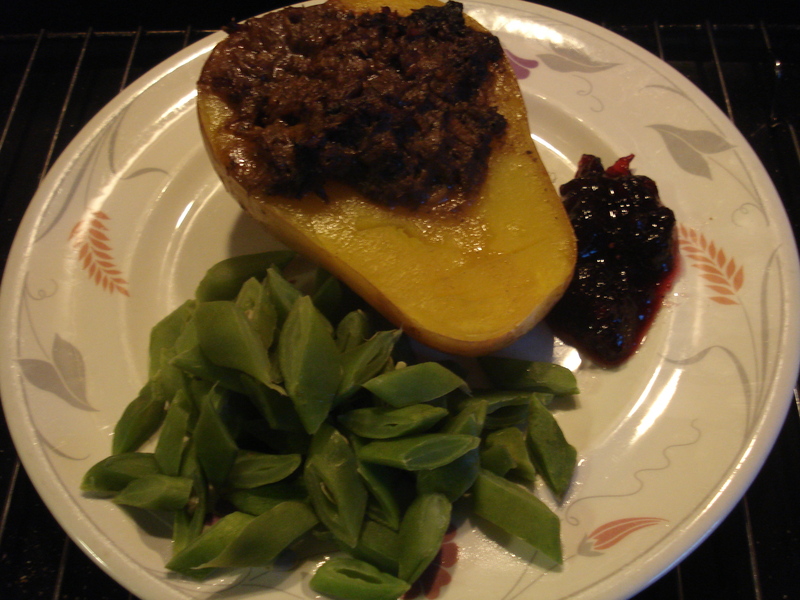 Bake for 30 to 60 minutes, until squash is tender and beef is hot through. You can put the dish in the oven before the oven is fully pre-heated, and you can keep it warm in the oven if dinner is delayed. The meat will eventually dry out, so keep it covered to minimize loss of moisture. Serve with a green vegetable and complement the dish with a chutney or pickle based on a tart fruit, such as cranberry or rhubarb.